Super-K, K2K and T2K (the latter two combined) were recognized along with Daya Bay, KamLAND and SNO by the Breakthrough Prize Foundation, a relatively new award. 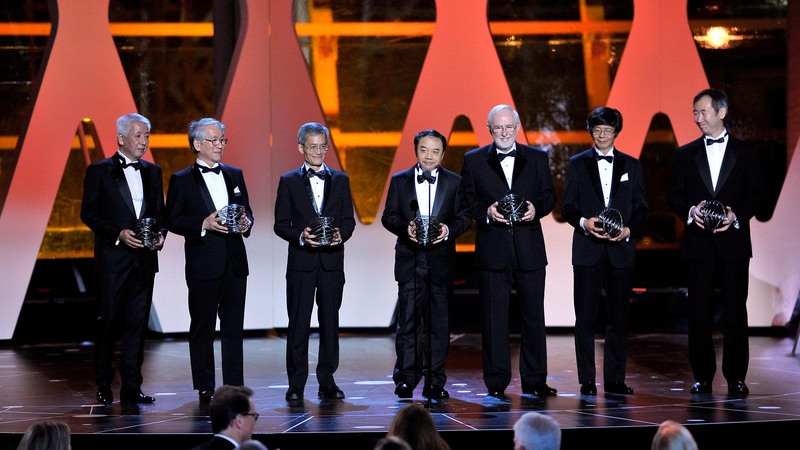 The awarded for Super-K was received by Kajita and Suzuki, with authors of the 1998 and 2001 atmospheric neutrino and solar neutrino papers being named as co-laureates. The K2K/T2K award was received by Nishikawa and likewise, numerous authors of key papers were named as co-laureates. Past and present BU Neutrino Group members named are: Flor de Maria Blaszczyk, Shantanu Desai, Fanny Dufour, Matt Earl, Alec Habig, Ed Kearns, Soo Bong Kim, Serge Likhoded, Mike Litos, Mark Messier, Colin Okada (SNO/KamLAND), Jen Raaf, Kate Scholberg, Jim Stone, Larry Sulak, Chris Walter, and Wei Wang.